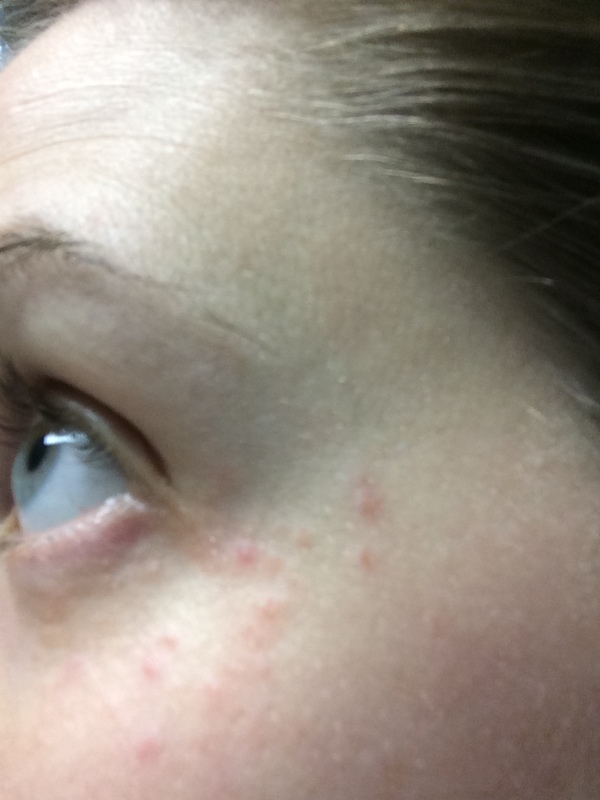 Perioral or Periocular dermatitis. If you’ve had it, you just shuddered a little. If you have it, you found this because you are searching for an answer. I don’t have answers, but I do have a story and hopefully mine will help shape yours. It started benign enough. A few spots around my left eye. Strange, but easily covered up with make up. I figured it was allergies. Shortly before it arrived, I had eaten some bad seafood, ending up with what was clearly an intestinal bacterial infection. I didn’t however connect the dots (pun intended) until much later. I battled mild intestinal upset for a couple months and ironically once it started to clear it, my face broke out like crazy. Spread to right eye, sides of my mouth, chin and between my eyebrows. It got red, flaky and inflamed. My research all pointed to yeast, but my dermatologist insisted that antibiotics were the best route and that it was likely bacteria. Since I’m breastfeeding and am highly anti-antibiotic, I passed. Here is the laundry list of topical products I tried and how they worked. Apple cider vinegar topically. (I already take it internally) – This marginally helped with the redness. Plain yogurt masks – Also helped with redness, but may actually feed the infection if it’s yeast. Tea tree oil – diluted with a carrier oil helped I think. It kills yeast and bacteria. Just use a drop or two. Osmia Organics PD line – these were designed by a physician that had PD herself. Very expensive, but nice products. Didn’t work for me, but may be worth a try. JaneGee Clear Skin Oil – I’ve used this for sometime, but stopped right around the time this showed up. I started on it again and saw no results initially, but gradually my PD got better. Regardless, this is an excellent product! JaneGee seaweed mask – this instantly made the redness and spots go down. Used it at night and my skin was always better in the morning. For the first 20 mins or so after taking it off the spots are really red, so don’t be alarmed. Call them to order. So while I did the topical stuff, I was convinced this was really coming from my gut. My immune system was shot from not sleeping (baby’s don’t “sleep like a baby”) and so the infection took a big hit and slashed my ability to fight off infection. My acupuncturist said it was yeast coming from my intestines and worsened by a malfunctioning immune system. So I went to a functional medicine practice to get some tests done. Tests confirmed I was battling a bacterial infection in my gut – Klebsiella Pneumonia to be exact. Normally, you guessed it, this is treated with antibiotics or an herb Uva Ursi. Neither were options according because of breastfeeding. The tests also showed an increase in food sensitivities (probably due to leaky gut) and yeast overgrowth. Even before I went, I noticed that my face was worse after eating beans, nuts, grains, seeds, eggs and drinking alcohol (all listed as sensitivites). So I eliminated these along with fruit (for yeast) for several weeks. My blood sugar dropped and I lost weight (something I can’t afford to lose). So I added back fruit and upped my protein intake. Luckily my blood sugar and energy up went, and my weight stabilized. But my face still looked horrible. So I said screw it and added back wine (I know, I know – I don’t smoke or eat crap, so I need one vice at least). It didn’t seem to make it much worse if I kept it to one glass. Even though my face still looked bad, my acupunturist said my immune system was improving and that my body was fighting off the yeast. I also went to a homeopathist who put me on a remedy to help regulate my hormones, which she thinks is also a factor. Then I started taking carpylic acid, which my lactation consultant said would be fine with breastfeeding. 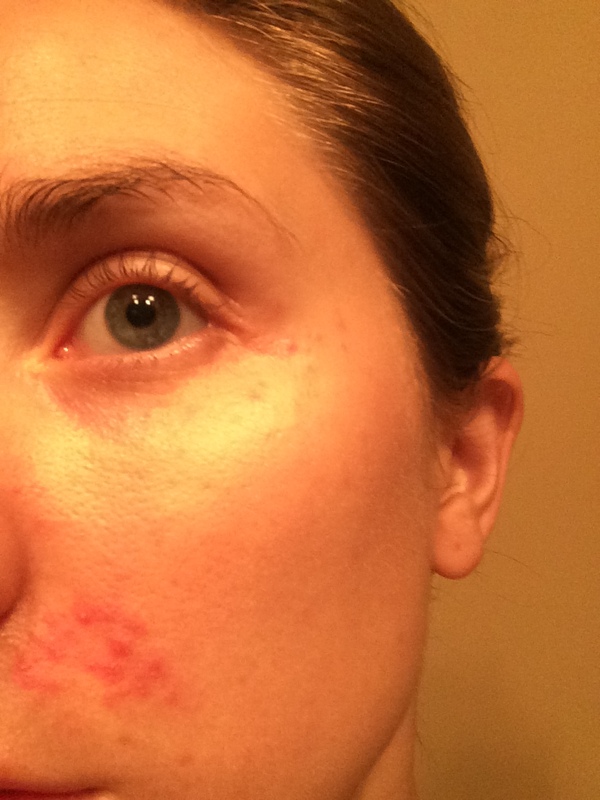 Within two days of starting the caprylic acid and the homeopathic remedy, my face began to clear! I slowly added back some foods and found grains, nuts and seeds to not affect me anymore. Beans and eggs will still make me break out a little as will a couple nights in a row of wine. I’m guessing that is because my gut is still a little leaky and infected with yeast. It’s been two weeks and I only have a few spots here and there. I think my immune system is kicking in and removing the yeast from my system along with help from the caprylic acid. So I hope this helps others struggling with this ugly condition. It is very likely that it is coming from your gut, which many other skin conditions do. Think back, have you done something or contracted something that could have changed your gut flora? Antibiotics, high sugar diet, weakened immune system….? One last thing! While you are healing and must wear makeup, use RMS Beauty un-cover up. It works well and it doesn’t irritate your skin! Hi Amy, I am struggling with perioral dermatitis and really belive all you are saying about your gut being the route of the problem. I never had bad skin in my life and I am now 36. I know your post is from 2014, but have you had any issues since…are you cured?! I am curious what homeopathic remedy you were following besides the prebiotics and caprylic acid? PS, love the rms products too! It doesn’t look like I responded. So sorry thought I had. It’s called Candida. I still struggle from time to time but it’s way better. When I eat too many carbs and drink too much it returns.